Compete Ryzen setups starting at $969. 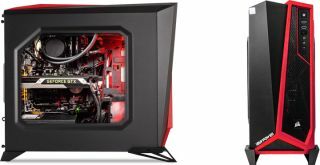 System builder iBuyPower now offers a range of gaming PCs featuring all three of AMD's newly launched Ryzen processors (Ryzen R7 1700, R7 1700X, and R7 1800X). These configurations start at $969, though one of the more interesting listings is the Ryzen Pro Daily Special. Go here to customize and/or purchase the Daily Special, and if you do, be sure to tick the box to receive your choice of For Honor or Ghost Recon: Wildland at not additional cost. As for the $969 configuration, the true starting price is a little higher than advertised if you don't already own an operating system that you can install—this one comes with a bare hard drive. The rest of the specs are similar except that it has an iBuyPower Slate Gaming case with two side glass windows, Ryzen R7 1700 processor, Radeon RX 470 graphics card with 4GB of GDDR5 memory, and a 1TB hard drive. The RAM, motherboard, CPU cooler, and power supply are the same. Other Ryzen configurations can be found here.